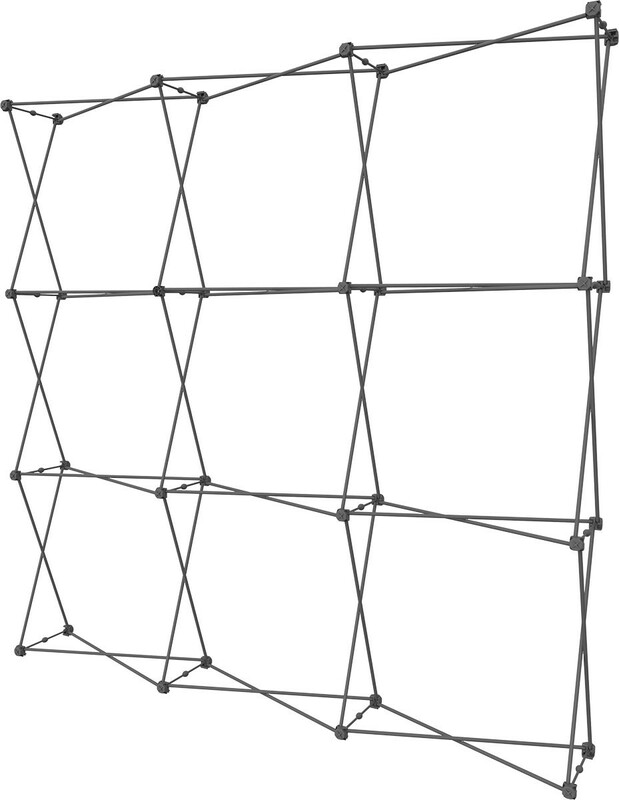 The XClaim 8' Fabric Pop Up Display Kit 3 has assembled dimensions of 87.92" wide x 88.23" high x 12.8" deep. The kit comes with the frame, graphics and drawstring carry bag. 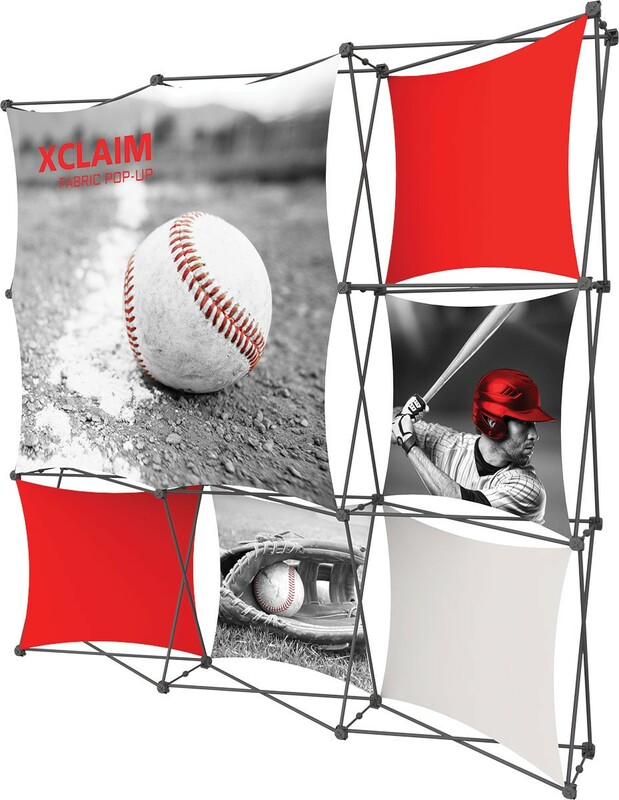 XClaim collage tension fabric pop up displays are sturdy yet lightweight, thanks to anodized aluminum tube construction of the scissor truss pop up frame. 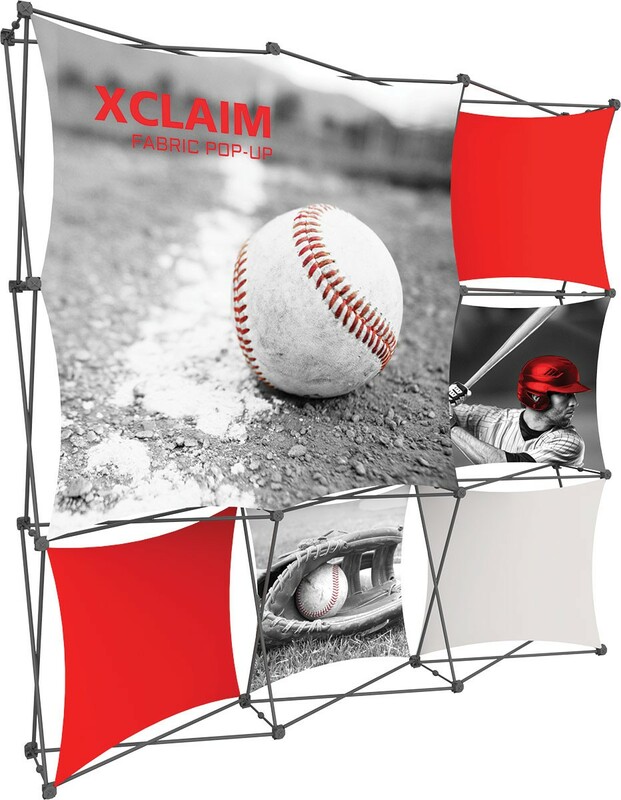 The XClaim fabric popup has a unique multi-dimensional look that's created with stretch fabric graphics attached to various points along the front and back of the display. The combination of layering with different sizes and shapes of the fabric graphics makes a visually interesting display that is sure to attract attention. 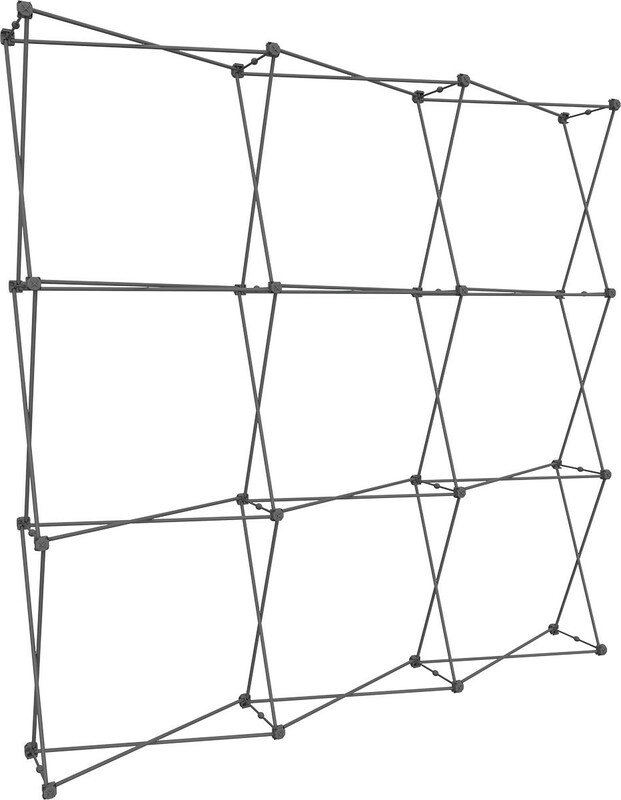 The stretch fabric graphic stay attached to the frame when it's collapsed making setup as easy as expanding the frame. When the display is expanded, the graphics are pulled tight, smoothing out any wrinkles, which is where tension fabric displays get their name. The frame has magnetic locking arms to keep the frame expanded while in use, and makes take down just as easy as the setup. Since the graphics attach to the frame with push fit silicone corners, they are easy to remove, and because they are printed using a dye sublimation process, they can even be machine washed, if necessary. This helps to keep the display looking good over time. The XClaim is available in a wide range of sizes for both table top use and as full height floor standing trade show displays. 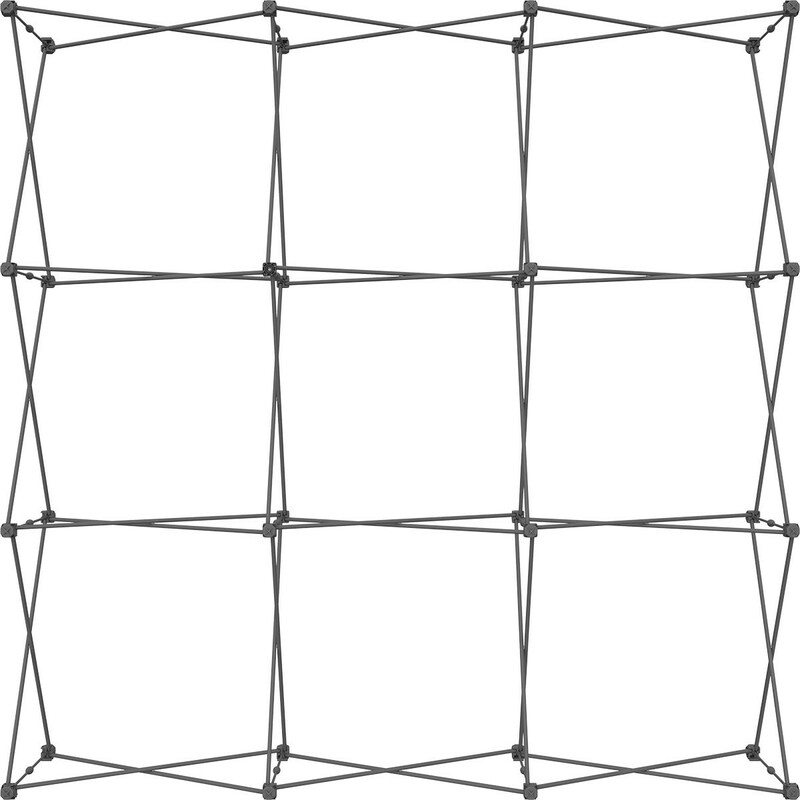 There are a variety of kits at each size, and each has different sizes and shapes of graphics that attached to various points on the frame to create a unique look. Custom a-la-carte graphics are also available on request. A hard shipping case is a good idea when traveling with the display. 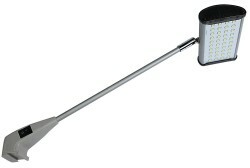 The Standard Molded Popup Case is the recommended model, and it can be found in the Related Products tab. 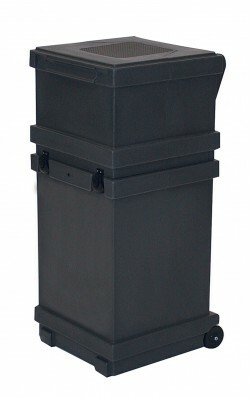 For lighting, the Lumina 200 or Lumina 200 LED floodlights are recommended and can also be found in the Related Products tab. Finished graphic size of panel A: 54.75" x 54.75"
Finished graphic size of panel B, C, D and F: 29.75" x 27.375"
Finished graphic size of panel E: 27.375" x 27.375"
Shipping size: 35" x 11" x 10"